Meet the owners Vaughn and Patty Stevens. 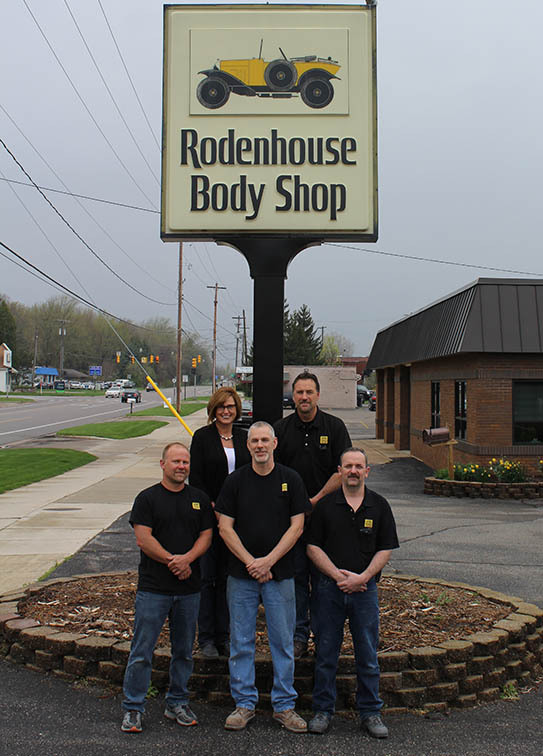 They have been married for 30 years, raised 3 daughters, and are onto their next adventure as owners of Rodenhouse Body Shop. Vaughn has been an employee of Rodenhouse Body Shop for 35 years with the last 20 years managing the day to day operations, and Patty has been in customer service for the past 15 years. They have been life long members of the Walker community and feel very blessed to be able to continue to maintain the reputation of fine customer service that Rodenhouse Body Shop has provided to their customers for the past 50 years. Our highly qualified staff has over 80 years combined collision repair experience. Our team will bring your vehicle back to life again with the most sophisticated technology and the finest factory finish paints. You have our word on it. Photo (Top Left to Right): Patty, Vaughn, Derek, Robb, Alan.